Many patients experience a wide range of emotions when dealing with a cancer diagnosis. Read how a much-needed renovation to the psychosocial services space at BC Cancer – Vancouver has been pivotal for experts to better provide emotional support to families impacted by cancer. 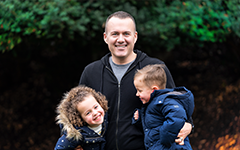 Read more from Jesse, who has been diagnosed five times with two different types of cancer. 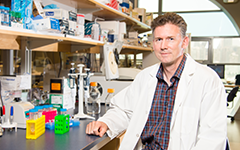 Dr. Robert Holt, co-director of BC Cancer’s Immunotherapy Program, and his team discovered a link between a bacteria and colon cancer. Now, along with 14 distinguished researchers, Dr. Holt will lead an international effort to explore the role microbiomes play in gastrointestinal cancer with a prestigious grant of up to $25 million from Cancer Research UK. Did you know that many treatments available today exist thanks to people who volunteered to take part in a clinical trial? Read how you can support clinical trials and help increase treatment options for patients. Join the race this April! The BC Cancer Foundation is proud to be a benefitting charity of the 2019 Vancouver Sun Run. Learn how you can join thousands of others in Canada’s largest 10K road race taking place Sunday, April 14. More than 3,700 people in B.C. are diagnosed with lung cancer each year. This month we welcome Dr. Stephen Lam, Leon Judah Blackmore Chair in Lung Cancer Research and chair of the Provincial Lung Tumour Group, BC Cancer, to our blog to share about his critical work in lung cancer prevention. Last year more than 27,000 British Columbians were diagnosed with cancer. In 15 years, that number will increase to over 40,000. This Monday, World Cancer Day ignited British Columbians to make cancer a priority by supporting research, care and infrastructure – learn how. We are the fundraising partner of BC Cancer. Together with our donors, we are changing the outcome for people affected by cancer in British Columbia and beyond by connecting personalized care, innovative research and opportunities to give and give back. Every dollar we raise stays right here at BC Cancer to advance research, enhance care and break down cancer to benefit the people of BC. You are receiving this because you have given us your email address and have asked to receive information from us. The BC Cancer Foundation respects your privacy. To unsubscribe, click here or reply to this email letting us know you would like to stop receiving emails.